Identifying Indian tools made from rock is moderately easy if you know what you're looking for. Indian artifacts may be strewn where there was once a settlement. 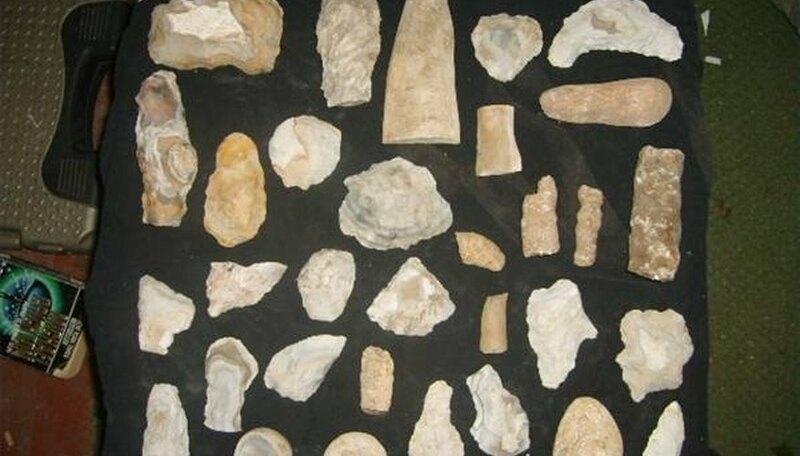 Arrowheads and bird points may be found at vantage points, such as cliff tops and bluffs, although only fragments or shards of these primitive tools may remain. You may sometimes find a perfect arrowhead as sharp as it was when it was made. Settlements were most often located by a source of fresh water and plenty of firewood. When the firewood ran out, the settlements were relocated. Cooking pots were often smashed or left behind and new pots crafted when the Indians reached the new location. Look for rocks partially buried under sand or dirt; if they look as if they have been shaped by human hands, they may indeed be Indian tools from long ago. Feel the tool you have found. 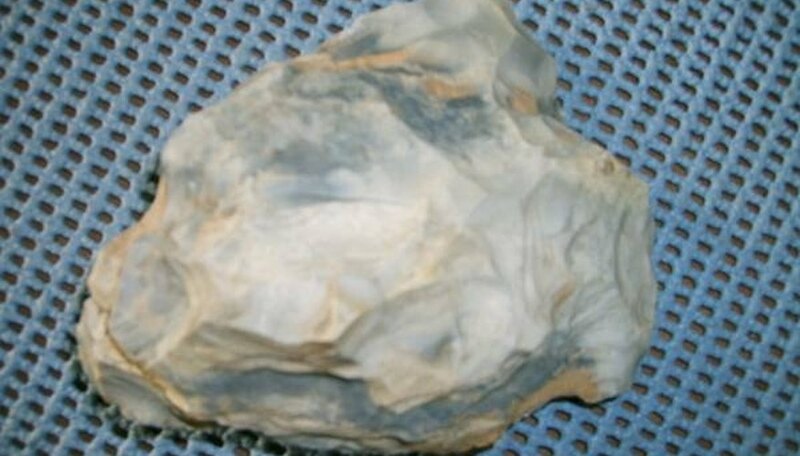 If it fits ergonomically in your hand and has been crafted, flaked and made from rock, it most likely is an Indian tool. You can discover hammers, awls, drills and scrapers in unlikely locations such as around lakeside homesites, old farmhouses and housing projects. These locations may have been built over Indian settlements. Primitive tools were crafted by the Indians to make their lives easier: They were made to kill, skin and process game; grind corn; craft adornments; and make clothes and shelter. 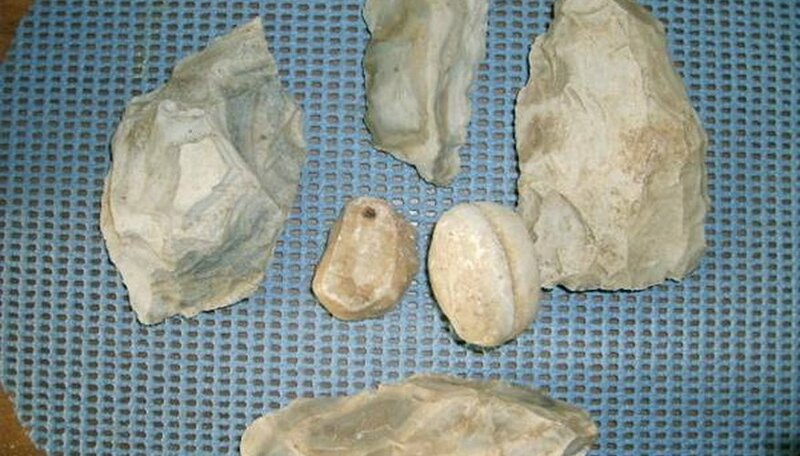 Finding large scrapers, spearheads and crafted tools in a particular location could mean that you have found a Paleolithic settlement. Paleolithic comes from the Greek words "paleo," meaning old, and "lithic," meaning stone. This type of settlement site dates back about 10,000 years. The large tools were crafted to kill and process large game abundant in the area at the time, such as mammoths. As large game became scarce, Indians began hunting and killing medium-size game. The Paleolithic period in North America comprised four distinct developmental phases: Paleo-Indian, Archaic, Woodland and Mississippian. In each developmental stage, stone tools became smaller and smaller as large game died out and smaller game took its place. Collectors of Indian relics may sell or trade part of their collection to other collectors. Extremely rare trades are often marked as being a former part of a distinguished person's collection of rarities even if they no longer belong to that person. Many collections of relics are priceless and not for sale. If the relic is found on your property, it is yours to keep or sell. Ensure that you have permission to take home any Indian artifacts you find. In many states, it is illegal even to touch Indian relics.